Because of all the rain here as of late, my garden is fairing splendidly. 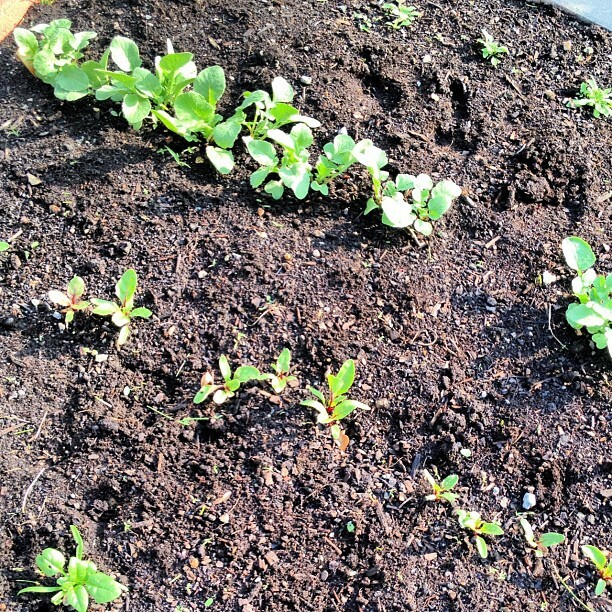 Yesterday after a chat with John, I realized an entire row of plants I thought might be beet seedlings trying to make their way into an actual beet were weeds! I pulled them up, so now my garden will thrive even more, I hope. Who knew you can tell if it’s a weed by the red root? Thanks, John! After the weed pulling, I checked the radishes. I saw the little red globe peeking its way up from the soil and I plucked it out. Since this is the first garden I’ve ever had, the feeling of seeing that perfect radish covered in dirt was close to child-like joy. I was thrilled and couldn’t resist picking two more. With abandon I ran (literally) into the house to show the husband. Impressive, he said. The funny thing about the impressive nature of these perfect radishes sitting on my counter is that I did next to nothing to create them. Bought some dirt, bought some seeds, planted the seeds, watered the seeds, watered the seeds, watered the seeds, said some prayers, pulled some weeds. Rewarded with radishes. So that was Radish Revelation #1: Things don’t have to be as hard as you think they are; just give it a try. This revelation is a big one for me, as I am an over-thinker. I think far too long before I put action words to my thoughts. All this time I was agonizing over how hard it must be to tend a garden; now I’m wondering why I waited so long to plant one! Perhaps I should have waited until I harvested more radishes in order to eat them in an acceptable dish like a salad, but I did not. I washed them and the husband and I bit into their radish goodness. Joe was surprised at their “spicy” bite . I was surprised at their juiciness and perfect crunch. I always thought radishes were a bit dry. 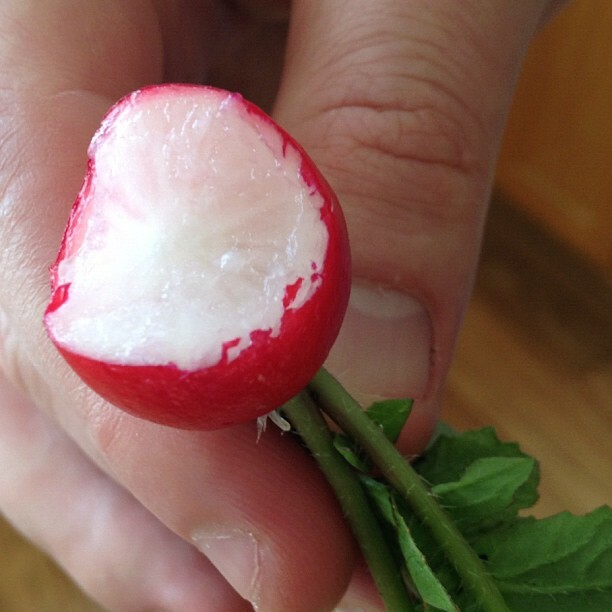 This is Radish Revelation #2: Radishes are NOT dried out little spheres and a pain to slice into salads. A fresh radish is filled with flavor and bursting with water. 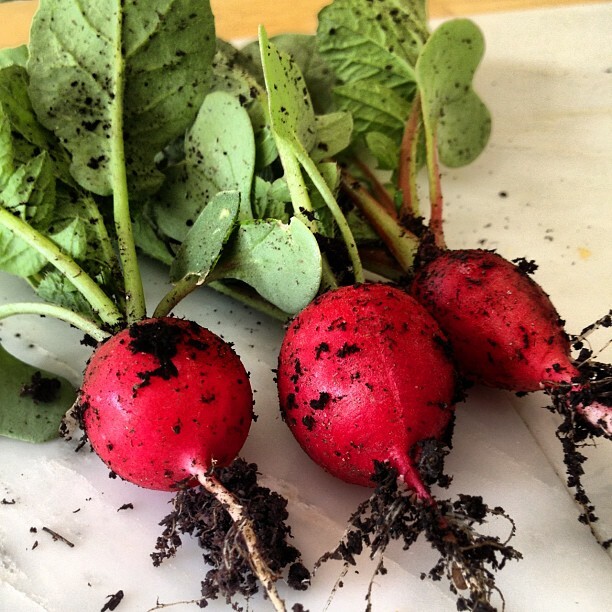 These two Radish Revelations are an affirmation of my local food experiment, and brought me to Radish Revelation #3: I need a bigger yard with a garden shed, because I want to plant a lot more radishes to share with friends! Anyone else have a revelation brought on by a vegetable, fruit, or food item? They look too perfect! Congrats! Oh, Canada. 😉 I’m sure you’ll be planting soon, right? Just a couple weeks left!